Spring is a great time to send a gift just to say you care or to celebrate a spring birthday, and this vibrant assortment is a perfect choice. 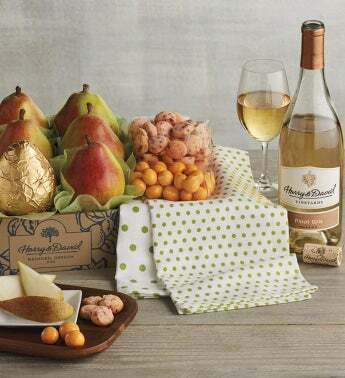 We've included our famous Harry & David® Pears, lemon raspberry button cookies, chocolate-covered pineapple, and a bottle of our deliciously refreshing Oregon Pinot Gris. We've also included a kitchen towel as a handy addition to this cheerful gift.